Last night I had the opportunity to speak to the Minnesota Quilters and my topic was Modern Quilts. It was a completely new talk for me, so I was very nervous. I usually steer clear from the "what is modern?" can of worms....but I shared a bit of my journey into modern quilting and did a trunk show. I'm thankful for the opportunity, and I am happy to call that a FINISH for the week! :) Thanks to the Minnesota Quilters for the warm welcome and the encouraging response! I also found a little bit of time this week to complete a quilt top. (Sorry about the rainy day photo!) It's a simple HST quilt top for charity. These blocks have been sitting around for well over a year...so it's nice to have them in quilt top form. I've been working SO hard on completing my WIPs. It sure isn't easy, but I'm currently down to 10! And that feels great!!! Now it's your turn! Please link up your finishes for the week. Thanks for joining me for finish it up Friday! What a lucky guild to have you as a speaker. I can relate to your conflict with summer, kids, sewing, etc. It is a tough one. Just have to find time for a little bit of each. 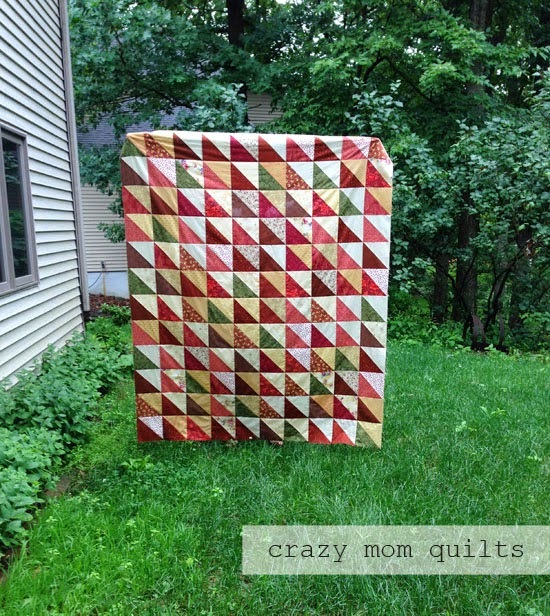 Wow, that's sn awesome quilt :0) I am with you on the 'crazy week' hopefully my next few will be less so now I've finished my BIG project of the last 3 months! Congrats on such a pretty finished top, Amanda Jean! Wish I could have been at the meeting, too. 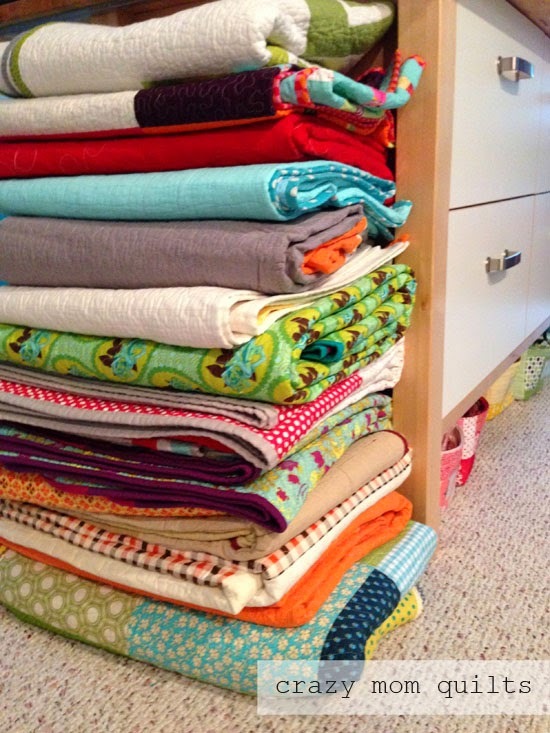 It would be wonderful to hear you speaking about modern quilts. Beautiful quilt! Thanks for sharing it with us. You know we all love eye candy. I am SURE you did a great job at the trunk show...and I would love to see all those lovelies unraveled! As for that gorgeous HST quilt...wow. I really love all the colors, the way all the triangles seem to face on direction and the fact that you only have 10!!!! to go!!!! You have EARNED YOUR WEEKEND GIRLIE! Wow, only 10? good job! hey video your talk and let us all hear/see it, put it on your blog! Its a gorgeous finish! Modern means so many different things to each person! It can be a hot and heavy conversation!! I would also loved to be there, great quilt top. Well done whittling down your WIP list. I find too many WIPs weighs me down mentally so I have trouble enjoying my sewing time. That is great. I am going to drive up that way sometime to visit some of my family and I am going to plan it for a class or talk or something of yours. What fun and your charity quilt looks great. I was lucky and was able to attend your talk last night. I very much enjoyed it! Thanks for coming! I was there at MN Quilters, too!!! You did a great job! You kept us all in stitches! Thanks for the inspiring talk. Loved seeing your quilts in person! If you need a charity to send that quilt along to, just let me know....I'll send you my address! It would look gorgeous on my couch!! Just saying. Wow, 10 WIPs! Go you! Only 10?!! I am vey impressed!!! I thought your truck show was great and as you put it most importantly you are a quilter! Thanks for your inspiring speech and thanks to the members of Minneapolis Modern Quilt guild for doing show and tell too! It was a very inspiring night. *sigh* I would give nearly anything to apologize for a rainy day photo. I can't even remember what rain looks like! A lovely quilt. I'm sure it will be well loved.